German soldiers of Artillerie-Regiment 814, 11th Army, Army Group Sud (South), cover their ears as a 240mm (9.45 inch) Haubitze 39 (Howitzer Model 39) fires at Red Army positions probably during the siege of Perekop. The Haubitze 39 was a Czech design from the Skoda works; only eighteen were made between April 1939 (when Germany took control of Czechoslovakia) and 1942. Artillerie-Regiment 814 was the only unit to operate these weapons. Formed on April 15, 1940, the Regiment served in the Crimea and was divided between the 6th and 11th Armies. Two divisions, one for each Army, had two batteries with four guns each. The howitzers were transported on three horse-drawn wagons. The 27,000 kilogram (60,000 pound) weapon chassis required a dug-in firing platform; you can see the fixing rods in the concrete holding the howitzer on its base in the lower right of the photo. It took artillery crews six to eight hours to prepare the howitzer for firing. Firing one to two rounds per minute, the Haubitze 39 could attack targets at 18,000 meters (20,000 yards). The 370 pound (166 kilogram) shell carried 50-52 pounds (22.9-23.6 kilograms) of TNT explosive. 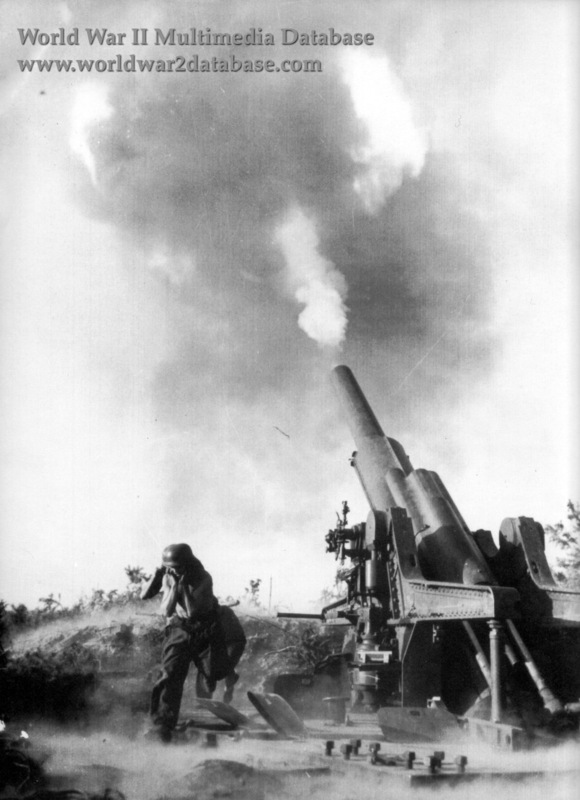 23,000 rounds were manufactured for the howitzers by 1945, but it's not clear if all the rounds were fired. 11th Army attacked the Soviet Union from Romania in June 1941 and approached Perekop, which was situated on the Isthmus of the Crimean peninsula, in late September 1941. The strong Red Army defenses were reduced during a five-day siege. The elimination of Perekop allowed the Germans to attack Sevastopol. 11th Army was inactivated on November 21, 1942 and used as the core of Army Group Don. The Haubitze 39s were sent to join the siege of Leningrad. In early 1944 Artillerie-Regiment 814 converted to more readily available howitzers that required less preparation time as the Wehrmacht retreated into Germany. The fate of the eighteen Haubitze 39s is not known.